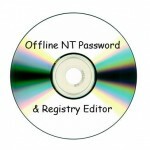 chntpw (also known as Offline NT Password & Registry Editor) is a free software utility for resetting or blanking local passwords used by Windows 8, 7, Vista, XP and 2000. It does this by editing the SAM database where Windows stores password hashes. It has become more and more popular because it can run under many Linux-based operating systems including Debian, Ubuntu, BackTrack, Fedora, Knoppix, Linux Mint. Now it has already been included in the most popular system repair discs such as Ultimate Boot CD (UBCD), Trinity Rescue CD, System Rescue CD, Ubuntu live CD, Hiren’s BootCD, etc. chntpw is a Linux program that comes with a commmand line interface. It’s pretty straightforward, especially if you use interactive mode. chntpw can be used to edit the Windows registry, reset a user password, and promote a user to administrator, as well as several other useful options. The main weaknesses is that chntpw doesn’t have a GUI interface that may be a litter difficult for computer novices. It does not work on Windows 8 Microsoft account, as well as domain accounts on domain controller. But overall it is an amazing Windows password recovery tool which allows you to remove, bypass, unlock and reset Windows login password. This is really useful when you need to regain access to your PC after forgotten the password. Chntpw is an open source project developed by Petter Nordahl-Hagen. This site is not in any way affiliated with, nor has it been authorized, or otherwise approved by Petter Nordahl-Hagen.